We accept most insurances and our staff is ready to answer any questions. Six Month checkups keep teeth happy and healthy. We take the time to make your visit count. Schedule yours today! We treat you like you are family. Dr. Chaconas and his team take great satisfaction in providing honest, quality dental care with a gentle style and a friendly atmosphere. 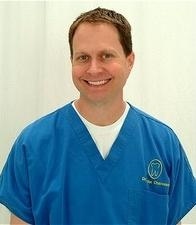 Dr. Chaconas is devoted to providing a dental experience that is relaxed and anxiety free. We offer a wide range of services including cleanings done by professional Hygienists, full restorations, crowns, teeth whitening, dentures, and cosmetic dentistry. Our patients know they are cared for and cared about which is why our practice is based primarily on referrals from our happy patients! Need a second opinion? We love to help people review those long treatment plans they get from other places not quite as conservative as our office. Schedule your consult today for quality dental care from a caring Dentist in practice in Dickinson, Texas for over 12 years. If we can help you with your dental needs or schedule an appointment for you, please contact us at 281-337-5262. Our office is located at 424 FM 517 W, Dickinson, TX 77539. Exit I-45 at the Dickinson exit, head west and we are just past the Dollar General Store on the left. Please call 281-337-5262 if you need further directions or information.